Muslim: Why do different Bibles have different numbers of books contained in them? 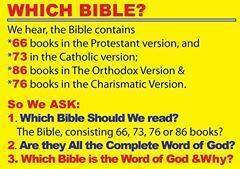 What are the actual books contained in the Bible? Christian: The Bible has 66 books. Thirty-nine in the Old Testament and twenty-seven in the New Testament. That is all. No more. No less. These are the inspired record of God’s word, written by prophets of God and eye witnesses of events. ALL Bibles contain these 66 books. Muslim: So tell me what are those extra books in some Bibles? Christian: The additional books are a collection of documents called the Apocrypha. They were not written by prophets, meaning they are not inspired by God like the scriptures are. They were written AFTER the last book of the Old Testament had been completed! They were written between 400 BC to 27 AD, by Jews for Jews, mainly to help in their understanding of Scriptures. These writings may be useful but it doesn’t mean they become part of the Bible. If a teacher of the scriptures writes a commentary/tafseer or notes explaining something in the scripture, or teaching about do the writings become the Bible? Of course not. Christian: They are documents containing literature, history, moral teachings, stories etc. It is deemed useful for knowledge or to get an understanding of the historical period of the time and to learn good moral examples. Christian: Let me try and explain it in a way you would understand. Can you tell me what the Hadith is? Muslim: Sure. Hadith is the collection of the record of the teachings, saying and deeds of Prophet Muhammad and his companions. Christian: Right. Is Hadith a part of the Quran? Christian: Are all Hadiths genuine? Muslim: There are authentic Hadiths, but there are also fabricated and weak Hadiths. Christian: Well, in a way, the Apocrypha can be compared to your Hadiths. Some parts of the Apocrypha is sahih but there is much of the Apocrypha that is ma’udu and da’if; weak, fabricated and unreliable. Sahih or not, Apocrypha is not a part of the Bible, just like the Sahih Hadiths are not a part of the Quran. Still just like the Hadiths, the Apocrypha is available to be read. If a Muslims reads the Quran and Sahih Hadith Bukhari together, does it mean the Quran and Sahih Bukhari are one compilation together? Muslim: OK. But how do you know the Apocrypha is weak and not reliable? Christian: First of all, as I said it was not written by prophets. The entire Old Testament writings were by prophets inspired by God to write. The Apocrypha doesn’t fit into any part of the Old Testament. It was not even written n the same language as the books of the Old Testament. When Jesus taught and preached, He quoted from many parts of the Old Testament, including the Torah, Psalms (Zabur) and the writings of the prophets but never once did Jesus ever quote anything from the apocrypha writings. When the disciples taught and preached, following the example of Jesus, they also quoted the words of Jesus and they quoted from the Old Testament, but they didn’t quote anything from the apocrypha. The Apocrypha was already circulating and available at the time but was not accepted as inspired scripture in the 1st century AD! Some centuries later, a few scholars suggested Apocrypha should be part of scriptures because of their usefulness but it was not accepted by the early church fathers. It was only as recently as the 16th century, when the Catholic Church decided to print Bibles as usual, the 66 books and also include the Apocrypha, so it can be read as well to together with Scriptures. This does not mean that the apocrypha is a new addition to the existing inspired Word of God. As I said the last book of the Old Testament was already completed by 400 BC. The apocrypha was written after that and began circulating later. To summarize, the Apocrypha is like your Hadiths. Some are useful, some are fabricated. They are not part of inspired divine scriptures. Some of them may contain some useful moral teaching or you can read and enjoy the literature in Apocrypha or learn more about the history of the period, around 400 BC to 27 AD. That is all. Some people may accept some of the apocrypha as authentic (sahih), some may reject others as weak (da’if) but NONE of the apocrypha belongs in the Bible. There are 66 books int he Bible and that is the fact. Does the Apocrypha Belong In The Bible?